Well it’s finally here. Election Day 2018. 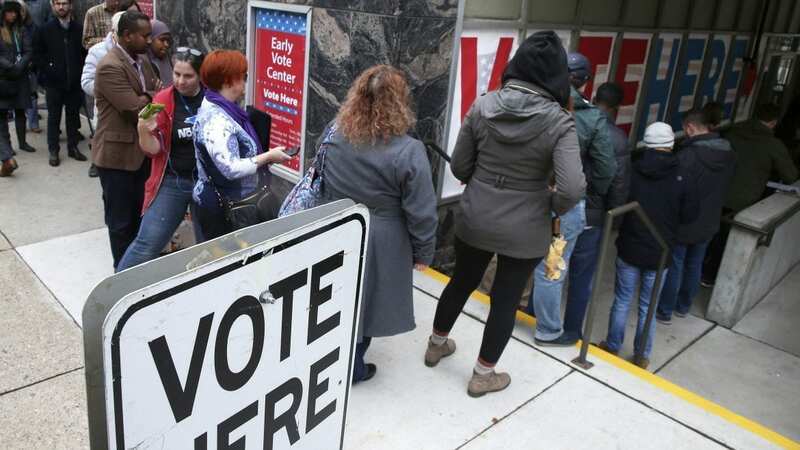 In the past, voters have not exactly beaten the doors down on midterm polling places. But this year, in some venues, some voters might feel like doing exactly that. Big turnout usually means lots of first-time voters. So here’s a quick set of do’s and don’ts for the big day. Some may be useful even if you’ve been voting for years. Do check your registration and make sure you’re going to the right polling place to minimize any potential hassle over your registration. If you’re planning to register on site (where permitted) be sure to have whatever your jurisdiction may require you to show. Do know the rules for casting a provisional ballot (if necessary) and making sure it is counted. Do allow plenty of time in case you find yourself standing in line, especially if you need to vote during the peak hours of rush in the morning and evening (or during lunch hour). It’s hard to beat the notion of showing up right as the polls open. Then you’ve got that button or sticker and you can lord it over the people you meet. Don’t keep checking your device(s) for “early results.” As a general rule, the earlier you start seeing something that claims to be authoritative – or even indicative – the less likely it is to be so. The earliest claims of knowledge are probably the ones that are least worth your time. Don’t volunteer to extend a rumor chain that’s nothing more than idle chatter. Don’t call around asking for “the latest exit polls.” All exit polls are inconclusive on Election Day, especially the earliest wave done early in the day. In recent years these early waves have skewed Democratic whether the eventual vote count will go that way or not. Don’t get carried away by hyper-enthused reporters on TV saying it’s the biggest turnout ever in this place or that. It may be so, in the end. But it will take time to make that determination, let alone to deduce what it means for the candidates or the parties if it is true. Don’t assume a big turnout always means the same thing. It may appear beneficial to Democrats, who in the past have suffered in low-turnout years. In the long hours of live TV coverage, any visual evidence of voters swarming the polls can seem persuasive. Resist being persuaded. Don’t keep calling your cousin who works for a network or a newspaper or a polling outfit, expecting them to have the answer hours before everyone else. If they did, you probably would not need to call them. Don’t put weight down on the exit polls even after the winners are determined. The 2016 exits greatly overstated the share of the vote cast by people with college degrees. Subsequent analysis and further research found the actual vote for this category was far less. The consequence was a lengthy period of misunderstanding the degree to which Hillary Clinton had lost the election because of her performance among voters without college degrees (especially those in the category who were also white and male). Don’t leap to conclusions based on what exit polls say the big issues were, or how the voters felt about them. In 2016, the exits said roughly 60 percent of the voters did not think Donald Trump was qualified to be president. You might think that meant he was losing, but you would be wrong. This year the exits may say the driving issue was health care, or immigration, or the economy. But prioritizing one particular issue does not always direct or even predict a vote. Don’t try to divine the direction of the races from the body language, facial expressions or word choices of people on TV. They may not know any more than you do, even if they act as though they do. Are they trying to keep you in suspense to keep you watching? Who knows? They just may not know what the final numbers are going to be. Don’t hunt around on Twitter for someone willing to give you the inside dope. Anyone claiming to have inside dope is just as likely to be one. And there is also the chance their inside information is coming from a robot-farm someplace far outside the U.S. The woods are full of people who thought they knew how elections were turning out before the count was in. In 2004, President George W. Bush’s White House was described as “funereal” in the late afternoon based on leaked exit poll data. The mood in that building brightened fast as those data proved to be wrong and Ohio tipped the vote Bush’s way. Going the other way, Republican nominee Mitt Romney was so sure he was going to win in 2012 that he did not have a concession speech prepared or even sketched out. He wound up giving what sounded like a last-minute edit of his victory speech, even as he congratulated incumbent President Obama on winning.